Here it is the day I got it. Most of the driver's side was sprayed with primer out of a spray can. The light yellow lacquer paint was faded and dull. Surface rust had started at the bottom of the fenders and doors. There was a visible hole in the left rear quarter panel behind the wheel. The convertible top had been removed, exposing the interior to to weather. The doors were adorned with cheap plastic sports mirrors, which were painted the body color. 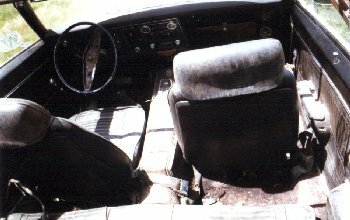 Here you can see the damage that was done to the interior by leaving it exposed to the elements. The vinyl seat material was stiff and brittle. Sitting in them, I could here the rusted springs crumble. The woodgrain console was faded and was turning a shade of gray. The door panels and quarter trim panels were ,of course, shot as well. The steering wheel was wrong for a 1969 Firebird and it was cracked and useless anyway. The original steering wheel was a 3 spoke type with the Pontiac logo in the middle with a stainless steel band around the perimeter. 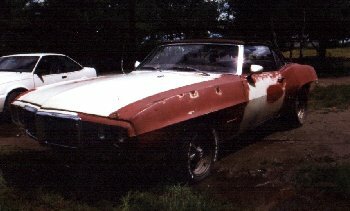 The vent balls were also wrong for a 1969 Firebird. In 1969 the vents looked more like a site from a riffle, a "+" with a "O" around the center. It was evident that there was a hole in the left rear floor pan by the way the carpet was sagging low. 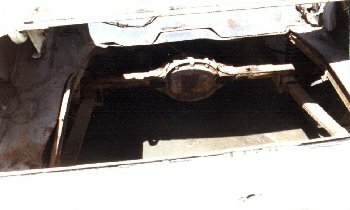 An inspection of the undercarriage showed that I needed to replace the rear floor pan. Also, at some point in the car's history holes were carved into the instrument panel and a set of oil and temperature gauges were added. Here is a picture of the engine compartment. The radiator and breather were in the back seat. The cast power steering pump bracket was missing and the pump was tied to the support brace. The original kickdown cable was missing and some other non-original one was installed on the transmission side, just to keep it from leaking. 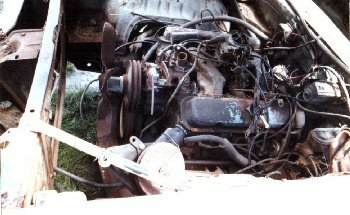 The car was not running when I got it and I had no intention of starting it since I was intending to perform a complete rebuild. It is not worth the risk doing damage to motor that may already have had problems. It seemed reasonable that there were problems and I was later found to be correct in my assumption. The person I bought it from had cut out the trunk pan because it was rusted through in the back. He had bought a new floor pan, which he obviously never installed. At least he gave it to me with the car.